Zone zone no. 4, and 5. 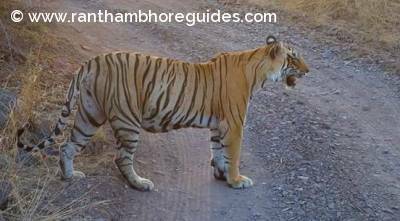 An icon of Ranthambhore Tiger Reserve-T-19 or Krishna and her current territory is covered to be even bigger than any other tigers of the park. Her territory includes the entire three lakes area, Singh-Dwar, Gular-kui, Tamba-Khan, Lakkada, Maggar- Dah, Gazzal –Hill, Mandoop, High-Point, Nal-Ghati, Khemcha Kund acorss zone no 2, 3, 4 and 5. The inherit of the Great Machhali - For once; she was very shy and quite timid in her childhood. 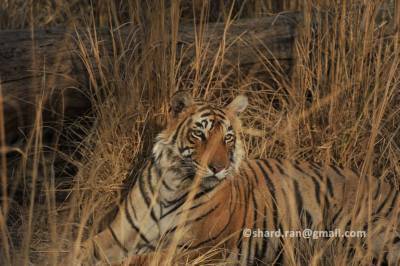 She is one of them from the family of legendary tigress Machhali who ruled the most beautiful area of Ranthambhore Tiger Reserve for more than 10 years. It is one of the three sisters from Machhali’s 5th and last litter (T-17, T-18, and T-19). She was born in 2006, during monsoon time to tigress Machhali and T-2, Ranthambhore's dominant male and was raised by her mother Machhali. She was given a perfect training to survive in wild. As an obedient cub, she spent her entire childhood to close to her famous mother and the sisters at all times in the significant area of three lakes and fort. After grew up as sub adults, her bold sister, T-17 was the most stronger in all three sisters and she becomes totally independent in the three lakes and fort area in 2008. Through territorial fight, T-17 defeated her both sisters (T-18 and T-19) first and later mother too. 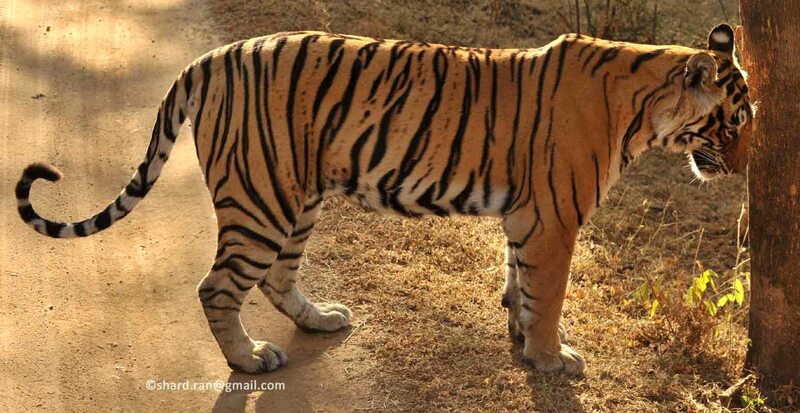 Therefore T-19 was forced to move in hilly area in eastern side of lake in Nal Ghati, Narsatta, Mandook, High Point, Lahpur area while her sister, T-18 was translocated to Sariska Tiger Reserve on 25/02/2009. After settle down in Lahpur valley, Krishna (T-19) gave birth to 3 cubs as her first litter of two males and one female in the year 2011. But, still she was sighted with her cubs occasionally in the park due to her shy nature. T-19 with her first litter was spotted on 26 May 2011 by nature guides, Saleem and Farid Khan at Nal Ghati area in zone no. 2. On 17 October 2013, forest dept. had issued tiger code (ID numbers) from T-48 to T-75 to all the sub adult cubs of the park. 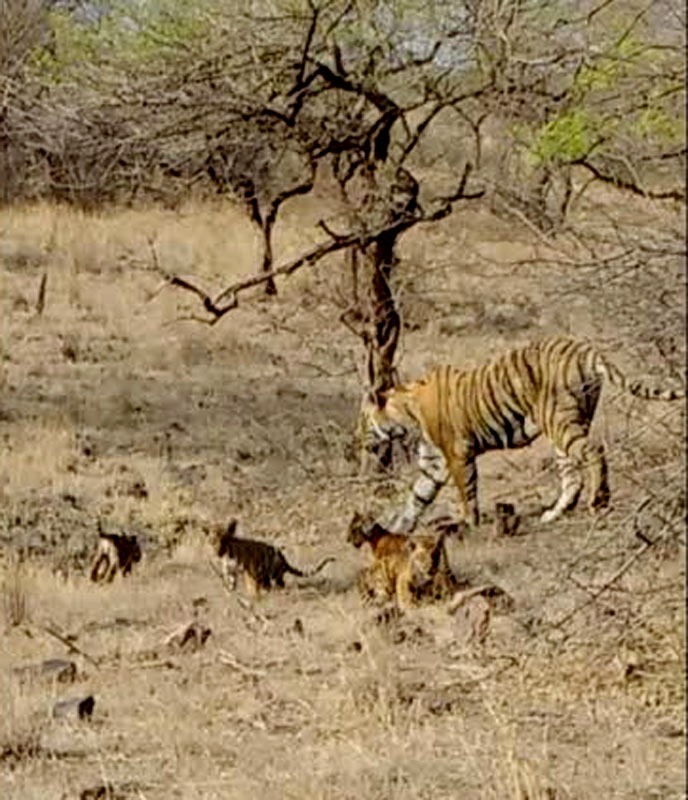 In this sequence, her 3 cubs got their tiger codes and names. The female cub is known as T-63, while the both male cubs are known as T-64 and T-65. Next year, Sunday 23 March 2014, she was spotted with her second litter of two females and one male first time while she was shifting her cubs by holding them in her mouth through her canine one by one by nature guide Ram Singh Meena with U K guest Oliver Gayle. It was unforgotten memory for lucky wild life tourists who saw Krishna with her 3 cubs… but… it was not climax. The climax came half month later, when the royal highness was walking with her four cubs in a queue like the March around Raj-Bag- Lake in the morning drive on 8 April 2014. It was fantasy for the wild life photographers and tourists, while they were shooting Iconic family by holding their cameras in their hands like they were giving Guard of Honor to the royal family in tiger kingdom, Ranthambhore Tiger Reserve. The climax revealed that T-19 had delivered four cubs not three in her second litter because the 4th cub of T19 was spotted first time. 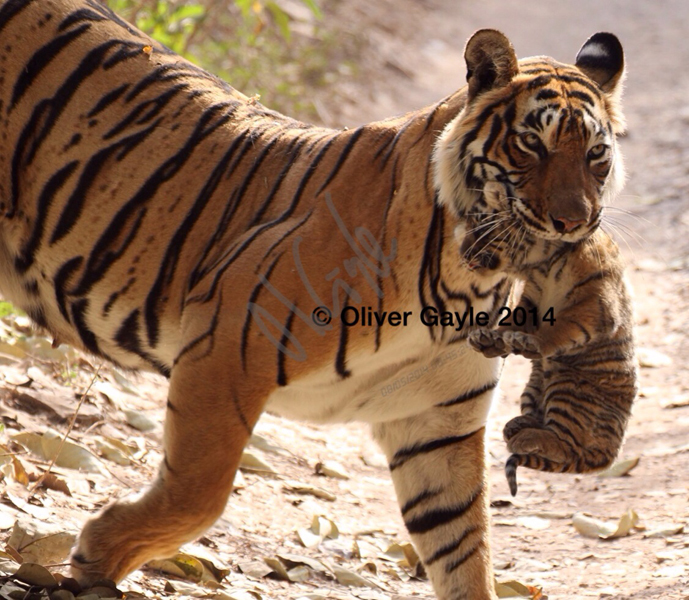 Then T-19 became the ICON of Ranthambhore Tiger Reserve and her four cubs were sighted continue till 18 April 2014. Unfortunately, after that one cub has been missed. Then T-19 and her 3 cubs have been sighted regularly and whole family became iconic family because it is the first choice for every wild life photographers and tourists from all over the world. Krishna was sighted with her 4 new cubs in the morning drive in zone no.4 first time. It is the 3rd litter of Krishna. 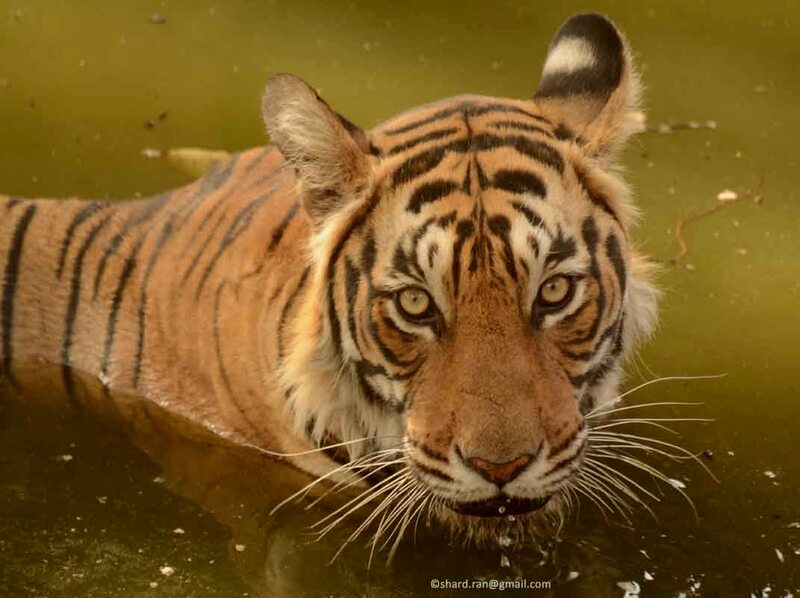 Great news from Ranthambhore Tiger Reserve. Copyright Mrs. Vinita with permission. I saw her two months ago ! Beautifull tiger! I had the honour of seeing Krishna as my first ever tiger sighting in Ranthambhore in 2014. I will never forget that experience and I long for a return visit to see her and other tigers of this great park. As a fellow conservationist I celebrate and congratulate all of the work that rangers and the Government do to support and protect these iconic and stupendous animals.! Very nice article with quite lot of info on a single tigress. Good job.???????????????????? A well written article. It is so good to be able to read about the famous family. It is really wonderfull tiger profile . Now no doubt T-19 is Icon of Ranthambhore Tiger Reserve.